Given the dominance of mining in the region, it is not surprising that most narrators mention the industry in some way. There are other small industries such as the extraction of sand and limestone, and local cooperatives are starting up bakeries, garment-making businesses etc, but generally there is a real dearth of any manufacturing industry. Several narrators are clearly frustrated by the lack of investment and training which would enable them to start up alternative industries - to change the region from being just an exporter of raw materials, and to provide employment and a future for young people. "The future of my community will depend on the development of the small industries we have here." (Peru 4). Although large-scale industry has had a devastating effect on the area, mining has long been a local industry and when operated privately and on a small-scale was a useful supplement to the area's economy. There is evidence that the mineral-rich mountains were being tapped for their wealth at the time of the Incas: "There are even things in the indigenous languages which tell of minerals, foundries, indigenous mining works." (Peru 1) One man explains that "mining in Cerro de Pasco began in the pre-Inca era whilst Haricapcha dates from 1630 in the Christian era." According to local legend, it was Haricapcha who discovered the minerals in Cerro de Pasco. "This legend," he explains, "is very similar to one they tell in Bolivia. Maybe our miners, our people took a few ideas, made up others and joined the Bolivian character up with the Cerro [one]" (Peru 25). Despite the often negative effect of more recent mining activities, the pragmatists among the narrators recognise that the industry is now so linked to the region's fortunes that the only approach to adopt is to campaign for improved working conditions and environmental practices, and above all to ensure that the wealth it generates to start benefiting those living in the mountains which yield the minerals. Without the mines, one man says, ".we're destined to disappear. Look at the experiences of other mining towns such as Potosi in Bolivia, Potosi in Mexico, Santa Barbara de Carhuacan and the Huancavelican mines. All the mineral research on this area shows that mining can only last 60 or 70 years more" (Peru 25). "I still think mining has to give to other sectors, it has to give something back and create new jobs. Cerro de Pasco.is both a mining and agricultural area. The mine has to contribute to this, it has to support and promote a resurgence in agriculture and cattle breeding. because no town in this world, with but a few exceptions, have been hit as hard as we have. I mean with that grey wound, the great open wound. It's synonymous with progress, technical advance, the mining industry, but that's for those who get good use of these primary products, it's not for the people of Pasco. We haven't seen one cent of it, there has been no investment in our favour, absolutely none." "The smelter has produced hundreds of thousands of millions of dollars. They have taken the gold, the silver, but there hasn't been equitable appropriate social development. They have destroyed the campesinos, the communities, and even their workers, who have been paid miserable salaries, get sick and whose families must live in small one-room houses. but what is important is to think about our land so that this place progresses, and we don't start going backwards. Mining is important, it is something that nature gave the central region. Not only to the region but to our country. But mining should not only enrich a few, it should benefit everyone, especially the people from the regions, their communities." "I agreed with the nationalisation [plan] of the government. 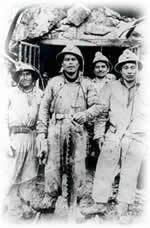 The gringos were taking all our minerals and they didn't pay us anything for them, and they paid the workers very little. When it became Centromin we were okay, and after, although the wages improved a bit, little by little we realised that things were just the same and they even got worse. like in the camps, for example, they ignored housing improvements. they even fired people later on and didn't pay good wages. There were strikes carried out by the workers... I participated.What's more, I can tell you, Centromin hasn't done anything for the neighbouring communities who've suffered because of the mining contamination." "Before the gringos appeared, it was already known that this area was rich in minerals, but they weren't mined on a large scale. When the gringos arrived things changed and their presence influenced things, the area went from being a cattle- rearing area to being a mining area and whole communities were affected." "The gringos knew how to win the confidence of our village, of our people simply by being nice, by their ability to teach. Under the guise of being able to do anything, the Gringos basically won the respect of our people... but gave nothing in return. But with the change to Centromin nothing improved. Basically when they just started to nationalise it, when they handed the companies over to the Peruvians, the problems got worse.because the technology.was really against us. If the gringos had been here maybe the problem of the pollution.would have been solved by now."